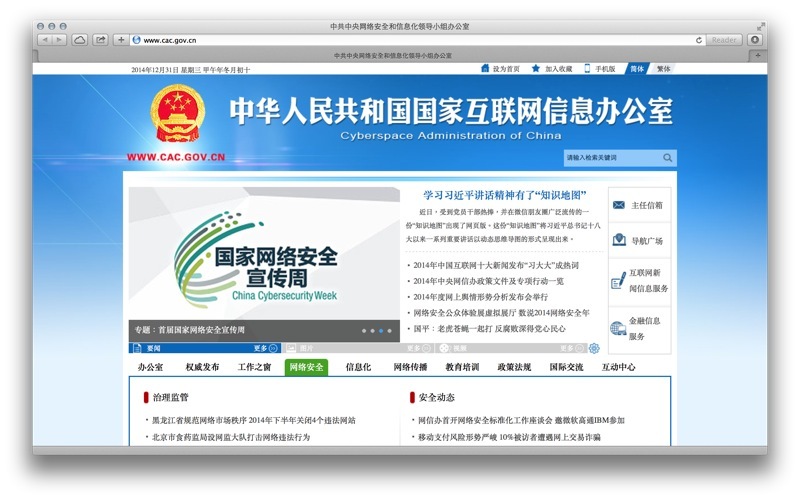 In a fitting move (for a Web site of a Web authority in China), the Chinese Cyberspace Administration (中华人民共和国国家互联网信息办公室), which operates also as the CCP’s Office of the Central Leading Group for Cyberspace Affairs (中共中央网络安全和信息化领导小组办公室), has just opened its website at cac.gov.cn. Visible on the front page are features on Xi Jinping’s net-related speeches (as he heads these offices as well), as well as somewhat controversial World Internet Conference held in Wuzhen, news about the China Cybersecurity Week, and details on the US-China Internet Industry Forum. Also seen on the main page are somewhat self-congratulatory editorials by a pro-Beijing commentator writing under the nom de plume of Guo Ping (国平), as well as news of more closures of web sites “in poor taste”. Of note is that none of the site is available in English. This presents a huge language barrier to “interested” foreigners who might have wanted to hear more about how the Chinese government manages the Internet. Without an English version, one will probably end up hearing more about “what they already know”: censorship, closures, and the Great Firewall. The authorities seem to have lost an opportunity to explain to an international audience why the Internet is managed as it is in China.